Impulsive and intrepid psychotherapist, Juliet Grey, can’t resist responding to an anonymous text message telling her to go to Hammersmith Bridge at dawn. But it isn’t simply the dead body in the water that disturbs her, it’s the way something uniquely personal to Juliet has been left on the corpse. Another obscure message – another London bridge – and Juliet finds herself caught up with a serial killer, who leaves personal mementos instead of collecting trophies. Teaming up with local detective, DCI Brad Madison, Juliet strives to find out why she has been targeted and how it’s connected to the accident that killed her brother, nineteen years ago. You might remember AJ Waines’s guest post here on The London Diaries back in August. Forgotten already? Click here to check it out. I love a good book set in London. There’s a part of me that enjoys picking out landmarks, bits of “my” London, in the text and feeling a big smug that I actually live here. 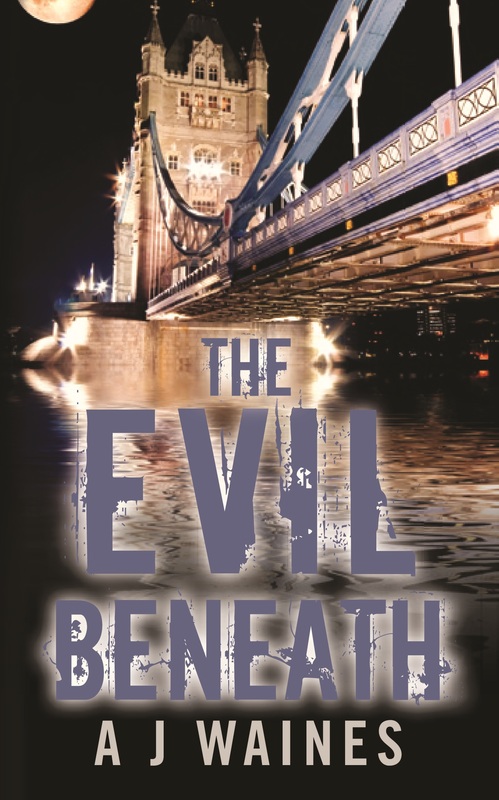 The Evil Beneath made that very easy using several of London’s iconic bridges as crime scenes… I pass over Battersea Bridge to and from work every day! I thought Waines’s use of London landmarks was cleverly done. Juliet Grey is a fantastic character, multi-faceted and with a history as interesting as the rest of the book. I loved that she took charge of the situation, often taking investigative matters in her own hands to get the job done. She had gumption and was an interesting leading lady—not at all weak and feminine as is often the case in thrillers. Waines is a brilliant writer who knows what she’s doing. How she’s not been snapped up by a publisher yet is beyond me. She deftly weaves clues and juicy morsels into Juliet’s story to create an atmosphere of tension that kept me turning pages until the wee hours, desperate to find out who the creepy murderer was. The combination of a mystery from Juliet’s past and the murders with a connection to Juliet twisted together to form a cracking read. For more information on AJ Waines or The Evil Beneath, check out her website which also provides links to purchase the book.